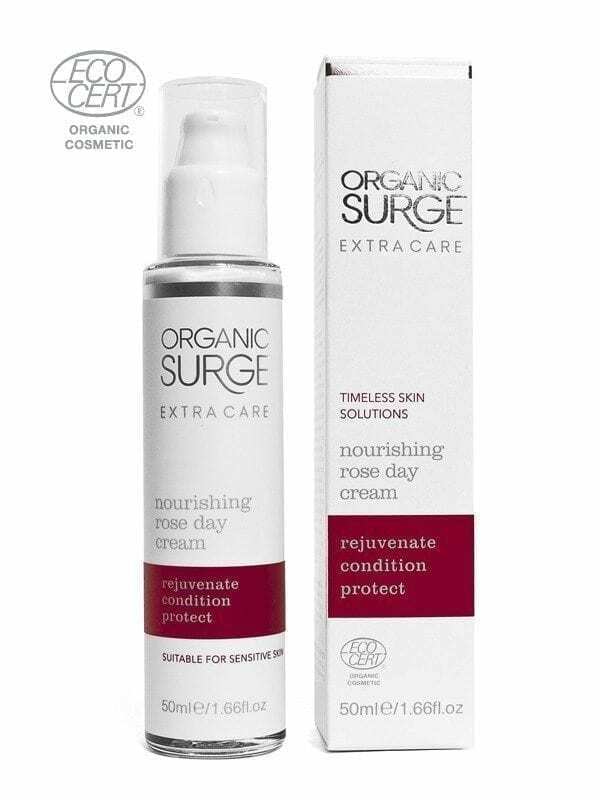 Organic Surge’s Extra Care Range features natural face and body creams, lotions and serums which hold the key to timeless, healthy skin. Luxurious, organic rose day cream is a rich, soothing, nourishing day time formula that helps to counteract fine lines, leaving even the most sensitive of skin hydrated, nourished and bursting with health. Formulated with only the finest organic ingredients, this natural cream provides instant hydration and nutrition to dry and sensitive skin, and may be suitable for skin prone to rosacea. Powerful natural ingredients, such as Damask Rose, will help to calm redness, while promoting skin restoration. Deeply moisturising Argan oil will nourish your skin, whilst palmarosa and geranium oils will infuse skin with vital moisture for a luminous and supple complexion, whilst supporting your skin’s natural age-defying defences. With its light texture, this moisturiser is also suitable as an eye cream. It is suited to all sensitive skin types, including, normal, dry and mature. A light cream which is excellent under make-up. Apply after cleansing by massaging into your face and neck with gentle upward strokes. For extra hydration use Replenishing Facial Oil underneath.